Thursday, June 20, 6:30 & 7:30 PM: PJ Party on the Trolley with David LaRochelle! It's back . . . The PJ Party on the Trolley is so super, silly, and special, we had to bring it back this summer with one of our favorite authors: David LaRochelle. TICKETS FOR THE JUNE 20TH TROLLEY ARE SOLD OUT! 2. You are served cookies and milk on the station platform. Yum! 3. All aboard the trolley! 4. After a fun, fun, fun ride, we stop in a quiet spot. While still on the trolley, our guest author and Illustrator David LaRochelle reads some bedtime stories. 5. More trolley riding back to the station! Tickets sell out fast. If you don't get tickets this time, don't lose hope. There will be two more PJ Parties (July and August), plus a Trick 'R Trolley for Halloween. Remember, tickets cannot be purchased over the phone, in the store, or on the website; they can only be reserved through the emai list, so sign up now! David LaRochelle's book Isle of You is currently available from LibraryThing Early Reviewers. 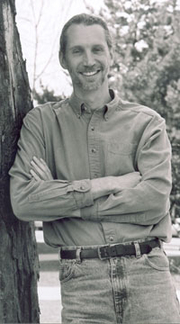 David LaRochelle is currently considered a "single author." If one or more works are by a distinct, homonymous authors, go ahead and split the author. David LaRochelle is composed of 3 names. You can examine and separate out names.